We interrupt this non-regularly scheduled (but at least in order) posting for a special announcement: I made center piece today with two photos and an article!!! 🙂 This is the first time that I have done double-duty with photo and a little writing. It was exciting to see, so I just wanted to let you guys know and to post it. I will put up more photos of the Ag 180 event later. Daniel Meadows, an agriculture engineering senior, transplants flowers and bushes at the Old Episcopal Burying Ground near Third and Elm streets Saturday as part of the Ag 180 service project. Ag 180 participants Savannah Speed, left, an animal science sophomore, and Tabitha Graham, a biosystems and agriculture engineering freshman, clean windows at the American Cancer Society Hope Lodge near Commonwealth Stadium on Saturday. About 40 students from the College of Agriculture participated Saturday in the first annual Ag 180: Turning Students into Leaders through Service. Samuel Evans, a Student Government senator for the College of Agriculture, said he created the service event to compliment the Ag Bash, which draws many agriculture students out each fall. “This is definitely one of the coolest things I’ve ever done – organize this event from the ground up,” said Evans, an agriculture education junior. 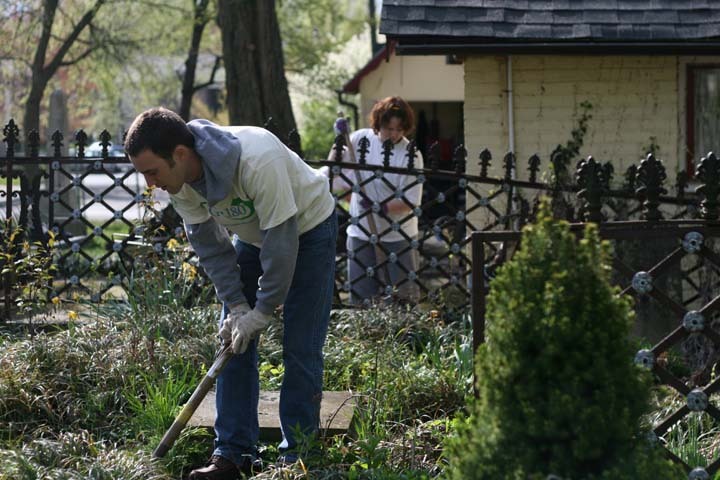 Volunteers signed up to work at one of seven locations around Lexington, including the Arboretum, the Lexington Senior Citizens Center, the Old Episcopal Burying Ground and the American Cancer Society Hope Lodge. Tasks varied from landscaping to indoor cleaning projects. “It’s basically the whole reason I joined Student Government,” he said. Evans planned and coordinated the event with the College of Agriculture Student Council. Participants received free T-shirts and lunch. Anna Hormann, a pre-veterinary sophomore and site leader, said she hopes the event keeps growing each year. The article and photos are the property of the Kentucky Kernel and Kristin Sherrard so please do not steal them!! !